It all began with a recommendation. Phoenix Creative needed a broadcast writer to assist them in the development of a new TV and radio campaign for one of their clients. They asked Mike Sneden, a director at The Arbor Group if he knew of anyone that could help and he mentioned my name. The good folks at Phoenix Creative reached out to me, asking if I was interested and after a get-acquainted meeting where I met the team that I’d be working with, I was awarded the assignment: develop eight new TV commercials and eight new radio spots promoting a variety of topics for Jensen Tire & Auto out of Omaha, Nebraska. 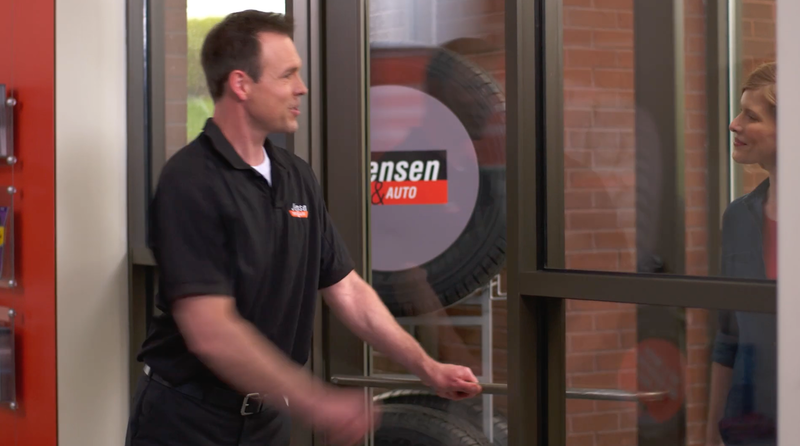 A still from one of eight new TV commercials developed for Jensen Tire & Auto out of Omaha, Nebraska. Deans Lynch was my key point of contact. Becca Jordan was the account coordinator who kept me in the know. And Matt Mauger was the art director/agency producer who ultimately would be turning my scripts into storyboards and then, working with Mike Sneden as director, turn those boards into actual commercials and my radio scripts into radio commercials. Our initial download on the Jensen brand was full of information and gave me a solid understanding of the tone, style and expectations they hoped I could match. They gave me a list of about 10 potential commercial topics, provided a good creative brief and strategy and told me to see what I could come up with. Jensen Tire & Auto is a locally-owned, family-owned operation that has been in the Omaha area since 1973. They’re honest. Straightforward. Down-to-earth. They’re proud of their stores, the people who work there and they all work hard to deliver the best in service and services. Both the TV and radio concepts had to reflect that. So I began generating ideas. I wrote a variety of scripts – from the customer point-of-view, the employee point-of-view and a few from the store manager point-of-view. I wanted to be clever – but not overly so. I wanted to find interesting ways to help deliver key points of difference. At our first internal presentation, I presented campaign directions. We narrowed those down and I went back to work. At our next presentation, I presented more script ideas on the campaign directions I had previously presented. We narrowed those down some more and I went back to work. By our third presentation, we had zeroed in on the direction – then I needed to fill out the roster, making sure I covered all of the topics that had ultimately been decided upon. We fine-tuned some more. After all those meetings, I understood just how well the people at Phoenix understood their client. Ultimately, we narrowed down the script candidates and Matt went to the story boarding process. I, in turn, started in on the radio scripts and with a stronger understanding of what would and wouldn’t fly, I seemed to fall into the Jensen point-of-view and hit the mark right off the bat with a few of the scripts. By the time we made the trip to Omaha for the client presentation, we were more than ready and I truly felt a part of the team – and for that, I congratulate and thank Deans, Becca and Matt for how they welcomed me and enabled me to play a key role in the presentation. The homework, teamwork and hard work all paid off. The result is a new broadcast campaign that began airing earlier this summer and will continue for many months to come. This was a working partnership that really worked.